Part Four: Animal Welfare Standards; Are They Globally Achievable? Advances in Agricultural Animal Welfare fully explores developments in the key areas of agricultural animal welfare assessment and improvement. Analyzing current topical issues, as well as reviewing the historical welfare issues, the volume is a comprehensive review of the field. Divided into five sections, the book opens in Part One by reviewing advances in animal welfare science, examining cognitive psychology, genetics and genomics. Part Two then looks at transdisciplinary research in animal welfare, with coverage of bioethics, welfare and sustainability from both environmental and food safety perspectives. Part Three explores the process of translating science into policy and practice, followed by discussion on the global achievability of welfare standards in Part Four. Finally, Part Five highlights some emerging issues in agricultural animal welfare. 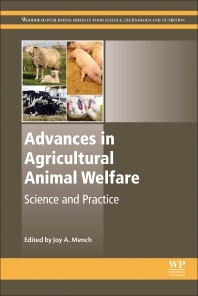 This book is an essential part of the wider ranging series Advances in Farm Animal Welfare, with coverage of cattle, sheep, pigs, poultry and aquaculture. With its expert editor and international team of contributors, Advances in Agricultural Animal Welfare is a key reference tool for welfare research scientists and students, practicing vets involved in welfare assessment, and indeed anyone with a professional interest in the welfare of agricultural animals.